In Chronicle I, we thoroughly examined the doctrine of transubstantiation its history, practice, and real meaning. But we have waited for this second article to answer the question: Why? Why must there be present in the Mass the literal body and blood of Jesus? What purpose does it serve? And in the words of Pope Pius IV: "I profess likewise that in the mass there is offered to God a true, proper, and propitiatory (conciliatory, to soothe the anger of, to win or regain the goodwill of, to appease, placate or make friendly, to reconcile - Webster's New World Dictionary and Harper's Bible Dictionary) sacrifice for the living and the dead." (From the fifth article of the creed of Pope Pius IV). That is the incredible truth! The Roman Catholic Church believes and teaches that in every Mass, in every church, throughout the world (estimated at up to 200,000 Masses a day), that Jesus Christ is being offered up again, physically, as a sacrifice for sin (benefiting not only those alive, but the dead as well!) ("It is appointed unto men once to die, but after this the judgment" Heb.9:27). Every Roman Mass is a re-creation of Jesus' death for the sins of the world. Not a symbolic re-creation! But a literal, actual offering of the flesh and blood of the Lord to make daily atonement for all the sins that have been daily committed since Jesus was crucified almost 2,000 years ago ("The Catholic Home Instruction Book", #3, p. 90). "If any one shall say that in these words, 'This do in remembrance of Me', Christ did not make the apostles priests, or did not ordain that they themselves and other priests should offer His body and blood, let him be anathema." "If any one shall say that the sacrifice of the Mass is only of praise and thanksgiving, or a bare commemoration of the sacrifice performed on the cross, but not propitiatory; or that it is of benefit only to the person who takes it, and ought not to be offered for the living and the dead for sins, punishments, satisfactions, and other necessities, let him be accursed." 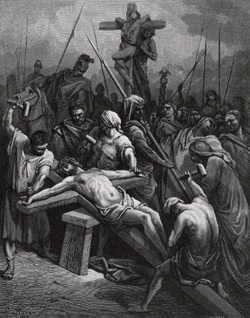 "If any one shall say that a blasphemy is ascribed to the most holy sacrifice of Christ performed on the cross by the sacrifice of the Mass let him be accursed." "At the Last Supper...our Saviour instituted the Eucharistic sacrifice of His body and blood. He did this in order to perpetuate the sacrifice of the cross..." p.154, The Documents of Vatican II, Walter M. Abbott, S.J. "What makes the Mass the most exalted of all sacrifices is the nature of the victim, Christ Himself. For the Mass is the continuation of Christ's sacrifice which He offered through His life and death. Jesus then, is the priest, the offerer of the sacrifice. But Christ was not only the priest of this sacrifice (of the cross), He was also the victim, the very object itself of this sacrifice. Every true believer loves the sound of these words: "It is finished!" (John 19:30). For it is the wonderful exclamation that the Lord's suffering was finally over. He had fulfilled His mission! Jesus had lived a life of sorrow, bearing the burden of a world gone mad. He had been rejected by everyone, even His closest friends. He had lived a perfect life before men and God, and His reward on earth was to be laughed at, spat upon, beaten beyond recognition, and finally nailed to a cross. But He had submitted willingly, because it was the will of His Father to offer Him as the satisfaction of the penalty for all the sin in the world past, present and future! But here, in the words of a Roman Catholic priest, is the "true meaning" of the words "it is finished!" "These words do not declare that His sacrifice was finished, but that He had finished His former, normal, earthly life and was now fixed in the state of a victim...He then began His everlasting career as the perpetual sacrifice of the new law." ("The Sacrifice of Christ" by Fr. Richard W. Grace.) Hence, according to Rome, Jesus must be forever dying for sin, "perpetually". Have you ever wondered why in every Catholic Church they still have Jesus up on the cross? Every crucifix with Jesus portrayed as nailed to it, tells the whole Catholic story Jesus is still dying for the sins of the world! But that's a lie! We need only look to the Scriptures to see the truth. "Who needeth not daily, as those high priests, to offer up sacrifice, first for his own sins, and then for the people's: For this He did once, when He offered up Himself" (7:27). "...by His own blood He entered in once into the holy place, having obtained eternal redemption for us" (9:12). "Nor yet that He should offer Himself often...but now once in the end of the world hath He appeared to put away sin by the sacrifice of Himself...so Christ was once offered to bear the sins of many; and unto them that look for Him shall He appear the second time without sin unto salvation" (9:25-28). "...we are sanctified through the offering of the body of Jesus Christ once for all. And every priest standeth daily ministering and offering oftentimes the same sacrifices, which can never take away sins: but this man, after He had offered one sacrifice for the sins for ever, sat down on the right hand of God...for by one offering He hath perfected for ever them that are sanctified" (10:10-14). Notice that throughout these verses occurs the statement "once for all" which shows how perfect, complete and final Jesus' sacrifice was! His work on the cross constituted one historic event which need never be repeated and which in fact cannot be repeated. As Paul says, "Christ, being raised from the dead dieth no more" (Romans 6:9). Any pretense of a continuous offering for sin is worse than vain, it is blasphemy and true fulfillment of the Scripture, "Seeing they crucify to themselves the Son of God afresh, and put Him to an open shame" (Heb. 6:6). Jesus not only became the perfect sacrifice for sin, but after being accepted by God as having totally fulfilled the requirements of the old covenant, He became "the mediator of a better covenant" (Heb. 8:6). That means that Jesus is the high priest of every true believer! "There is one mediator between God and men, the man Jesus Christ" (I Tim. 2:5). The Bible teaches that the priesthood of Jesus Christ is unique "Thou art a priest forever after the order of Melchizedek" (Psalm 110:4 and Hebrews 7:17.) "...because He abides forever, (He) holds His priesthood permanently" (which means that it cannot be transferred to another!) (Heb. 7:17, 24). This explains the great adulation and honor heaped upon the Roman priest. The French Catholic Saint J.B.M. Vianney said that "Where there is no priest there is no sacrifice, and where there is no sacrifice there is no religion...without the priest the death and passion of our Lord would be of no avail to us...see the power of the priest! By one word from his lips, he changes a piece of bread into a God! A greater feat than the creation of a world." He also said, "If I were to meet a priest and an angel, I would salute the priest before saluting the angel. The angel is a friend of God, but the priest holds the place of God...next to God Himself, the priest is everything!" What humiliation for Jesus Christ, the One who has been given a name "above all other names!" It is clear that the whole of Roman teaching and belief is founded on this premise of the continual sacrifice of Christ for sin: "It should be easy to see why the Mass holds such an important place in the Church's life. The Mass is the very essence of the Church. Within it the Church's life, and the Church's very existence is centered. If there were no mass, there could be no Catholic Church. The Mass is our act of worship, an act which we know to be really worthy of God, because it is the sacrifice of God's own Son. "What the sacrifices of the old law were unable to accomplish what no other form of human worship can accomplish - the Mass performs: Perfect atonement is made for sin. It is made thoroughly clear that Rome will forever put its faith in the Mass for the eternal forgiveness of sins. To remove this belief from her system of theology, would be like knocking out the pillars of a great edifice the whole building would come tumbling down! As I sat stunned, reading all the "Let them be accursed" - threats of the Council of Trent, I could not help but think how their curses would only fall back on their own heads for the words of our brother Paul call out across the centuries: "But even though we, or an angel from heaven, should preach to you a gospel contrary to that which we have preached to you, let him be accursed!" (Gal.1:8). Not only does Paul warn that an authentic angel from heaven should not be heeded while preaching a "different doctrine", but he gives the ultimate warning "...even though we"! Paul strictly warned the Galatians, not even to listen to him - the chief apostle and master of true doctrine - if he should reverse himself on any of the fundamental teachings of the gospel. How much more then, should we reject the appalling traditions and practices of a system that is not only unbiblical, but is actually steeped in mysticism, bordering dangerously on the occult! CONCLUSION: THE DEFINITION OF A "CULT"
Who Jesus is: Son of God, God the Son, Creator of the Universe. What He came to do: to die once for all, for the sins of mankind, then raise from the dead as the eternal high priest of all true believers. How a person directly benefits from Christ's death for sin: he is accounted as righteous through a total faith and rest in the finished work of Christ, and becomes the possessor of God's free gift eternal life (salvation). The Roman Catholic Church has been considered a true christian faith, mainly because it is generally known that their theology is quite orthodox on point #1. But as we have pointed out in these two chronicles, they are perilously shaky on the atonement Christ's substitutionary death for sinners #2. But if there is any doubt left at all, as to whether or not the Roman Church is authentically and biblically Christian, there will be a complete and thorough study of the Roman view on how one obtains salvation in our third installment of "The Catholic Chronicles".